Aid organizations are distributing water filters to some 37,000 households in the Terai plains of southern Nepal who are being slowly poisoned by drinking arsenic-contaminated water. According to a soon to be published report by the government and the UN, 1.8 percent of the country’s wells have arsenic contamination exceeding the Nepal standard of 50 parts per billion (ppb). An additional 5.6 percent exceed the World Health Organization (WHO) standard of 10 ppb, said Madhav Pahari, water, sanitation and hygiene specialist for the UN Children’s Fund (UNICEF) in Nepal. That is a total of 84,411 contaminated wells. “There is some [arsenic-contaminated water], but not like in Bangladesh,” said Birendra Shakya, chief of the water quality section for the Department of Water Supply and Sewerage. Arsenic, which causes health problems like skin discoloration (melanosis), hardening of the skin (keratosis) and cancer, can contaminate groundwater naturally and through human activities such as mining. It can also come from pesticides and fertilizers that contain arsenic. Arsenic-contaminated water is a major problem in Bangladesh and West Bengal State in India. It has also turned up in some drinking water sources in Cambodia and Myanmar. In Nepal, some 37,000 households are exposed, mostly in the Terai region stretching along the border with India, which is home to 13 million people, nearly half the country’s population. Ninety percent of people in the Terai rely on groundwater for drinking water, according to UNICEF and government officials. Of the 20 districts in the Terai, the worst affected is Nawalparasi, where 26.0 percent of shallow wells failed to meet the WHO standard. One sample from Rupandehi District, just east of Nawalparasi, contained 2,620 ppb. A 2005 survey in the Kathmandu Valley conducted by the Japan International Cooperation Agency and the Environment and Public Health Organization (ENPHO) also found arsenic contamination, particularly in deep wells, of which 71.6 percent failed to meet the WHO standard, and 11.9 percent failed to meet the Nepali standard. One challenge has been ensuring safe drinking water - free from bacteria and arsenic. UNICEF’s Pahari said agencies were now working to promote the use of safe wells, which have been tested and painted with a check mark; improve existing dug wells that have been deemed arsenic-free to protect them from microbiological contamination; and distribute filters to remove arsenic from the water. 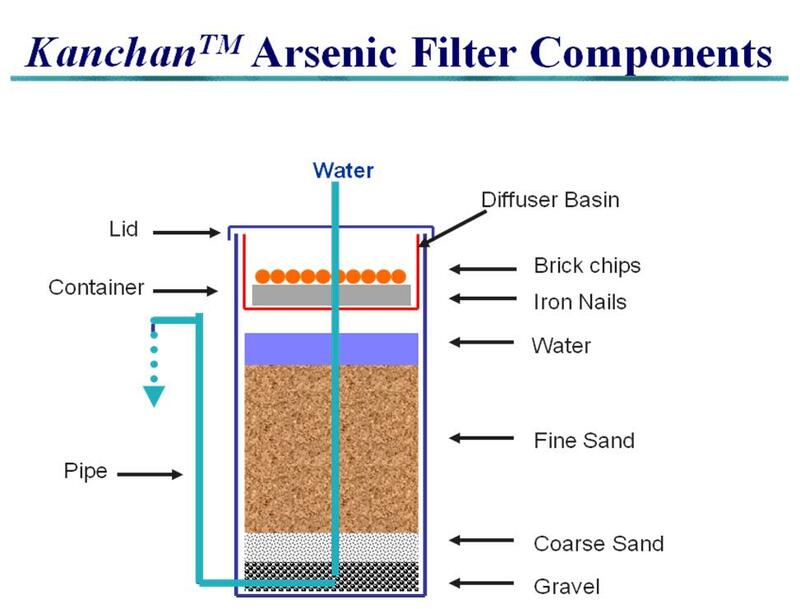 One of the filters being distributed, the Kanchan Arsenic Filter (KAF), was designed at the University of Calgary, and then developed and improved by the Massachusetts Institute of Technology (MIT), ENPHO and the Rural Water Supply and Sanitation Support Programme of Nepal. Through a slow sand filtration system, bacteria are removed from the water. The addition of rusty nails introduces ferric hydroxide (iron rust), which adsorbs arsenic onto its surface. The arsenic-loaded iron particles are then filtered out through the sand. KAF, which is sufficient to meet the drinking needs for about 20 people, costs about US$20 to construct from locally available materials, and needs to be cleaned periodically, said Suman K. Shakya, executive director of ENPHO. KAF is less than half the price of a ceramic filter, which generally costs about $50. According to Pahari, 27,000 children in Nepal died before their fifth birthday in 2008, 4.8 percent of which were because of diarrhoea. A major diarrhoea outbreak during the rainy season of 2009 led to 59,000 people falling ill in the mid and far western regions of Nepal and claimed more than 300 lives. Pahari said some 24,000 households have already been assisted, mostly with filters and also with improved dug wells. ENPHO, the Nepal Red Cross, UNICEF and UN Habitat are now working to assist the remaining 13,000 affected households.